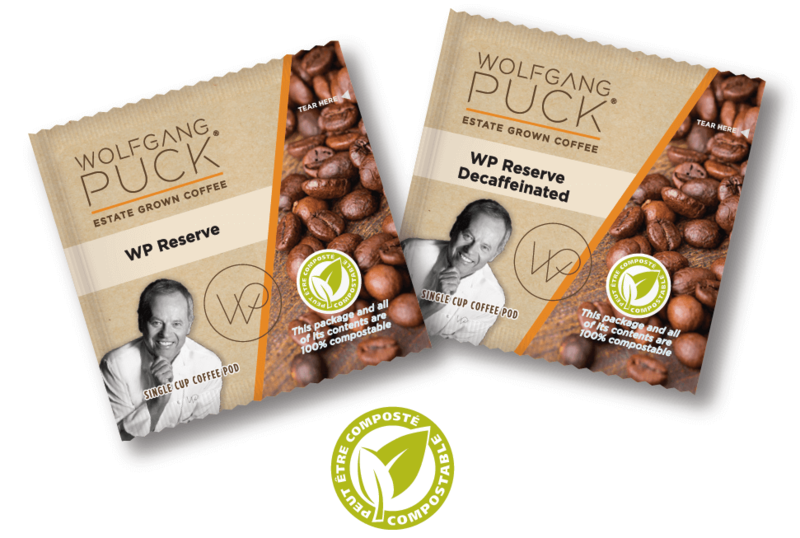 Wolfgang Puck coffee pods are now 100% compostable including the pod and packaging. Compostable means that a product can disintegrate into natural elements in a compost environment, leaving no toxicity. These recyclable pods are composed of a plastic cup, a proprietary non-woven filter material and foil lidding. After using the pod to make a cup of coffee, the consumer can peel off the lidding, compost the spent grounds, dispose of the filter and lidding and, finally, toss the plastic cup in the recycling bin. Enjoy your cup of coffee knowing that you are using an eco friendly product.